Yes, my journey comes to an end and I have bought a flight ticket back home on February, 2 from Bangkok to Colombo and then further on to Zurich. I am a little bit nervous, coming home after such a long time on the road and having neither a flat nor a job to go back to. It feels somehow just like another adventure, and in some ways even bigger than the going away. After finishing my almost seven months pilgrimage in Angkor I enjoyed one day of doing nothing and hangig by the pool. On the 25th of December I got on the bike again heading to Thailand and I was so happy to be on the road again that I rode all the 150km to the Thai-Border in one day. I crossed the border the next day and took a train from there down to Bangkok. After a few days in the capital Phnom Penh I headed northwards again, direction Preah Vihear tempel at the Thai-Cambodian border. I was prepared to meet some bad dirtroads in the remote junglearea of northern Cambodia, but what I found were newly paved roads with almost no traffic through remote areas, through forests and little villages for most of the time. 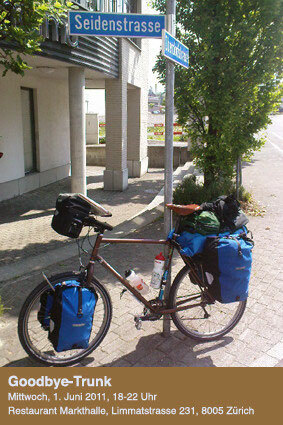 Great ride for five days to get to the tempel, where I could camp next to the army hospital. Preah Vihear tempel is still occupied by Cambodian army and the border to Thailand is closed. The last incident with some artillery was only last february. But now it is peacefull and quiet here and the temple on the 600m high mountain is really beautiful. The view over the flat land is awesome. After this I headed southwest to the temples of Angkor, taking the countryroads. In the overgrown ruins of the tempel of Beng Mealea - looks like a setting from Indiana Jones or Tomb Raider - I put up my tent in a quiet corner and stayed overnight. The next day I arrived in Siem Reap (Angkor tempels). So today it's christmas day and I enjoyed doing nothing, reading and relaxing at the pool on the top of my 10dollars-guesthouse. Just great! I like Cambodia! 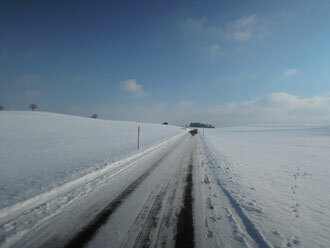 For a change it is flat and the roads are seald, which means 100 to 150km a day! It is really flat so far. Wolfi and I crossed the border along the Mekong in the northeast and we followed the river until the quiet little town of Kratie, where we had a look at the Irrawady Dolphins. Nice to see these big mammals in this huge river. It was also here where Wolfi and I split after cycling almost 4 weeks together. He went down to Ho Chi Minh City and I was heading east to Phnom Penh. From Kratie I followed a dirtroad along the Mekong and had to cross the river at some point on a ferry to get to Khampong Cham - there are only about three bridges over the "Cambodian" Mekong within 600km. The next day was a long 140km ride to Phnom Penh. Cycling into the city was less chaotic than I expected, it was even very easy and I was just flowing with the stream until I got to a cheap guesthouse in the center. What is most striking so far about Cambodia? 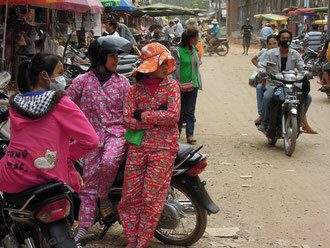 As I said flat, women wearing colourful Pijamas all day (see photo) and lots of mines from the civil war right next to the roads . Laos is great! Especially the people here are very laid back and very heartily. When I cycle through a village from the houses on the left and on the right what you hear is children shouting "falaaang!" and "sabaidee!" which means "foreigner!" and "helloooo!". I would describe it like this: In the Stans people would always invite you for tea, in Tibet people were nice but dogs were barking and chasing you from the left and the right, in China people were looking at me as if I was an alien and here people greet you whereever you go. Great! I am currently riding with Wolfgang a German cyclist and we had an excellent ride around the famous Kong Lo Cave. This is a cave made by a river that just flows through a mountain range. 7.5km long and dark as in a cow's belly we put our bicycles on the boats that took as on a 40minutes ride through the cavernlike cave to the other side, where there is nothing but a little village with houses on stilts and thick jungle. The next day we cycled 50km on narrow single trails through this rainforest. There were no direction signs and we were riding on intuition and geographical direction untill the road just disappeard in a lake... Luckily the next day some fishermen shiped us some kilometers across the lake where the road reappeared. Beautifull landscape! After an other 20km on washed out dirtroads through the forest we found some decent aspahlt roads and joined the route 13 again by sunset. I am at the very southern part of Laos now and will enter Cambodia about next week. All the best and relaxing pre-christmas-time! Just arrived yesterday after a 120km ride here in Luang Prabang, the most visited city in Laos. And it is very visited: Lots and lots of tourists here who fly in directly by plane. First I was looking forward to get some backpacker luxuries like pancakes and good coffee but after a day I just think of leaving the town as soon as possible again... It is a nice and relaxed town but just to touristy. The first day in Laos I crossed the border and camped in some bamboohut in a rubberplanting for two nights because it was raining one day. The next day camping in a bamboohut over some old cornfields with a beautiful view for the sunset and the fullmoonset! Alone in the midst of the jungle. Laos is so little populated that camping is again no problem but you always have to have some extra food with you for picknick, lunch or dinner. There are just not as many restaurants as there were in southern China. 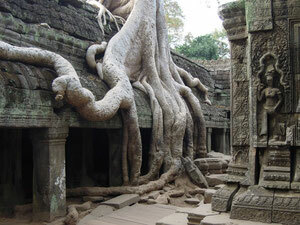 So soon I will head further south and hope to cross all of Laos within 30 days and get to Cambodia to visit there the mother of all temples: Angkor wat! The border between China and Myanmar at Ruili is definitely closed. So I took a 24h sleeper-bus for the 1000km to Jinghonng to cross the border to Laos instead. Today I changed some dollars, bought oatmeal for two weeks, peanut butter, a real baguette and some instant coffee. I've got a new raincoat from the youthhostel and found some cheap sandals at the market. So I think I am ready to dive into the jungle of Southeast Asia. After the incredible two days crossing of the mountainrange between the Mekong and the Nujiang river I was in a deep valley which goes straight from north to south, surrounded on both side by 4'000 to 5'500m high snowmountains. In the valley there is only one road, no junction for a few hundred kilometers! The Nujang valley is rather a canyon than a valley and there is not much more room than for a river and at its best for a road. And if you think cycling down a valley means easy cycling down all the way you're wrong: I was climbing still everyday between 400 and 1'300m! The road next to the river just goes up and down and of course a little bit more down than up. After five days cycling in a narrow valley I got a little bit depressed. Everything is so narrow, you see so little sky! By then I had arrived to the second junction and I took the chance to leave the valley to the west. Starting at 650m between banana and coffee-plantings I started climbing over the next mountain range. And I climbed and climbed and climbed... By 5 p.m. I had arrived at the pass at 2'150m, surrounded by rainforest. I spent the night up there and the next day it was going down to 1'000m and up some 1'000m again! That's the way it works here. I still made it till Tengchong on the same day. Tengchong is interesting because it lies at the border of the Eurasian and the Indian plate. So there are some nice exstinct volcanoes, geysirs and hot springs and a lot of coniferforest again. But after all I feel like leaving China after three and a half months and head for an other country, an other culture: To Southeast Asia! It's time to say goodbye to the Himalaya. And where could that be done better than at the 'sink' of the Himalayan Plateau, where four great rivers flow down towards the ocean. Three of them are in China and flow parallel from north to south digging deep canyons: The Yangtze-, the Mekong- and the Nujang-River (in Myanmar known as Salewen). So far so good. 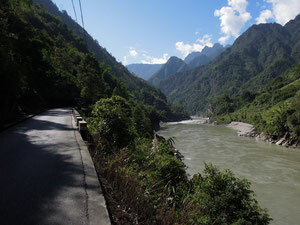 For the Yangtze river there is a road from Shangri-la to Deqin going from 3'400m down to about 2'000m and then up to 4'200m again before coming to Deqin again which lies at about 3500m. Roli and I decided to take the bus for this part since there is a lot of very dusty construction on the road. In Deqin we went to see Kawa Karpo, the 6'700m snowpeak just on the boarder between Yunnan and Tibet. A really beautiful peak! 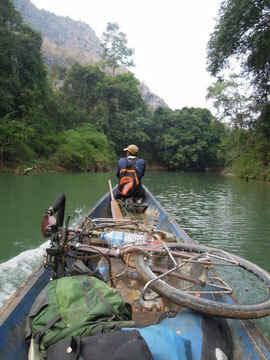 From Deqin then by bicycle down into the Mekong valley which is almost as dry as the upper Yangtze valley. This means a downhill from 3'500m to 1'900m and on the other side up again 200m to a little village of farmers. Although the Mekong is only about 20km airline-distance from the Nujang, there is no road to get to the neighboring valley. So the only way to cross the 4'000-6'000m mountainrange is to do it by mule. I hired a mule and two "horsewomen" (the men were all working on a new road) to bring me to the Nujang valley and left Rolli who took the road down the Mekong. We crossed the mountains in a very fast two days nonstop walking trip (normal is three days) on very steep and basic mountaintrails. The mule was carrying my paniers and I was pushing my bicycle. After two days and about 50km we arrived exhausted in Dimaluo down at about 1'800m again. 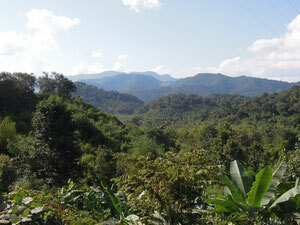 In the Nujang valley there is much more vegetation than in the other two valleys (see picture). A very humid cloud forest in the upper part, bamboo forests and extremly steep slopes with trees, ferns and moss further down. The path? 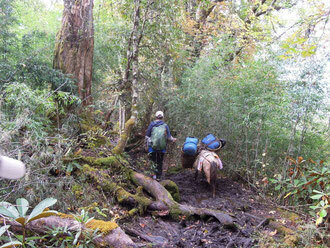 Narrow trekking path and very muddy and steep on the Nujang valley side. Shangri-la is really not very easy to access. At least not from the north: After seven passes on 450km from Litang, climbing 6'600m in six days I finally reached Shangri-la. These days I was cycling through beautiful, hilly and very remote areas of the Himalayan forested valleys. There were more or less no guesthouses or hotels on this stretch and camping was very easy in these high coniferforests. Although tough riding sometimes definitely one of the highlights of my journey. My first impression of Shangri-la: A lot seems to have changed since James Hilton's times... ;) But still a nice town to hang out some days, clean the bicycle after dusty roads, relax the tired legs from only going up and down the past six days and extend the visa before Chinese holidays beginn on the first of October. 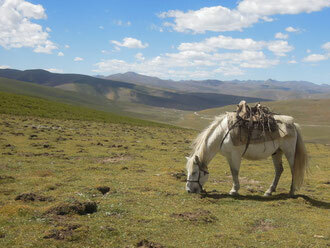 The start was tough: A beautiful day when I left Yushu but after 70km I stopped on the foot of a apparently big pass. Since I was just coming from Hong Kong (0m) stayed two days in Xining (2'400m) and another two days in Yushu (3'700m) I should still not underestimate the altitude. And after the pass who knows if it's going down or if it stays at this hight? So I made an early stopp and put up my tent already at 2 p.m. at 4'200m. In the evening I got a headache (mild symptom of mountain sickness). In the night it started raining and it didn't stop for about 24 hours. So I spent one whole day in my little tent waiting for better weather... The constant noise of rain on your tent can drive you crazy! The next morning good weather was there again and I felt well. So I started climbing the pass which turned out to be 4'700m high. So in the end it was good I spent another day aclimatising. After riding over a vast green high plateau with yaks to Serxu monastery where I could spend the night in the monastery hotel. Next day continuing. One night I could put up my tent next to some Tibetan herders tent and it was a clear and cold night at 4'300m. So cold that I had snow inside my tent from my breathing the next morning. The weather getting better and better I continued to the Dzogchen Gompa Monastery somewhere in the middle of nowhere, between two high passes and on the foot of a high snow capped mountain at the very end of a glacier valley. Beautiful place! A few hundred monks practising there. I could get a bed next to the monastery and even join the monks for ceremonies. For the first time for a very long time I saw some trees again. The spot was so beautiful I spent three nights there. It was also there, where I met an other tourist for the fierst time in a week: A young French hitchhiker. So it seemed that the road was officially open for tourists and I was legal here. So far I just pased any police checkpoints without stopping and nobody ever stopped me. ps: thanks to picasa and several hours in internet cafes in Hong Kong and Yushu I could finally upload some fotos. Check them out here! After more than one week of hassle we - the two canadian girls Mel and Kate and I - got our bicycles back in one piece, we were ready to start to the Tibetan Plateau from Golmud. The Chinese railway had sent our bikes to Lanzhou instaed of Dunhuang. And it takes a while to find out this when nobody speaks english. I decided to ride with the two Canadians up to the plateau and then turn east to Yushu and not to go into Tibet province. 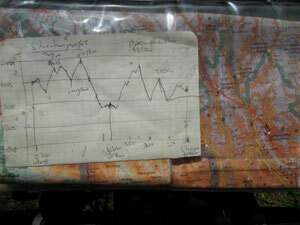 But still we had to pass one first checkpoint about 35km after Golmud. So we just disguised as Chinese cyclists - totaly covered with helmet, sunglasses, dustprotection, long sleeves and gloves - and just tried... and it worked! We passed at dusk at around 7p.m. the checkpoint and camped some kilometers after behind a abandonned gas station. The next evening the Chinese Army came when we were about to put up our tents somewhere next to the road and we thought "Now that's it, they will send us back" But instead they called a Chinese soldier who could speak some English and when he was here he came to us and said: "Welcome to this country! I am sorry you cannot camp here, this is military zone. But you can camp about 2km from here. Can I do something else for you?" The three of us were speachless... and of course we went up 2km and camped next to a Daoist temple. It took us four days to get up to the plateau because of the altitude (not more than 500m a day starting at 2'800m). The Kunlun Shanku is 4'760m and then we were on the Tibetan Plateau...! After the pass it didn't really go down. So you just stay on about 4'500m. We split the same day in the afternoon, when I took the turnoff at Budongqan to ride alone 750km to Yushu through nomans land. I was not so sure about the road, because it is not on every map and on googlemap you could see something like a road sometimes... also in the internet I could not find any information about it. The road went along one of the arms of later Yangtsekiang river. So flooding could be possible, which would be a problem if there were no bridges. The first 200km there was no village at all and on the 750km to Yushu there were about five villages on the map... So I carried food for about 8 days (!) with me in case I got stuck somewhere. There were lots of wild animals: antelopes, wild asses, eagles, vultures and even two wolfes... and a lot of Yaks all the time. As I got more into the greener hills towards Amdo the clouds became more and soon rain in the afternoon or night was normal (July and August are "rainy" season here). The ride was often pretty lonely through the hills but the road was much better than expected. It was always between 4'200m and 4'800m with about 8 passes or so. Just before Yushu I camped with some Tibetan monchs who had some sort of a festival with tents and ceremonies. And there somebody stole something from my bicycle. In the evening, when I realized it I got very angry and I said with loud voice to some of the young monchs who were staring and laughing at me, whoever has taken it should give it back. It took some time and some elder monchs who showed up too until one of the monchs said, he had seen it laying somewhere... (it was screwed to the bike). So in the evening one monch brought it back and I could go to sleep. So I just decided to use this occasion to make an excursion to Hong Kong for a week and come back to Yushu with my 40 days double entry visa and continue by bicycle south to Ganzi, Litang and Shangri La, where it should be no problem to extend the visa for 30 days. All the best from Yushu! Finally my bike has arrived where it should be. A real odysee and telephone calls with only chinese speaking clerks. In between the always encouraging "maybe tomorrow...". After two weeks of no-biking I will start today from Golmud towards the Tibetan plateau. Food for two weeks, money for a month and warm cloths I will head with two Canadian cyclists for a couple of days towards the province of Tibet, then will turn left 'overland' to Yushu over the very remote and little populated plateau. Looking forward to and being afraid of it at the same time...! So now I am sitting in the oasis Dunhuang and am waiting for my bicycle to arrive by train which will hopefully happen tomorrow. 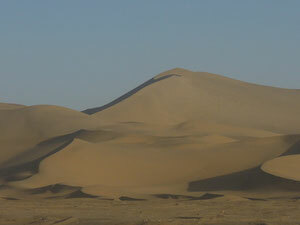 Dunhuang is a very nice city with a great night market (good food! ), so it's ok to spend some time here. Also there are a few nice spots to do some sightseeing like the 1'000 buddhas caves. All the best from Dunhuang! We climbed together the pass and it was a great feeling entering the Pamir Plateau that would be for the next few days our road between 3500 an 4600m. Right after the top we split again because I wanted to make a little detour to a remote lake, so we said goodbye again the same day. The Pamir Plateau is a beautiful desertlike plateau surrounded by 6'000m and 7'000m snowcapped peakes with only few people living here and also little or almost nonexistent traffic. Beautiful and quiet up here. The road after two weeks of bad loose gravel on the way to Khorog, the pamir highway was mostly paved with only little bits of no asphalt. At one time I had such good tailwinds I was able to make more than 100km on a single day despite a little detour with bad dirtroads. Camping on 4'000m was no problem, though one night it was quite windy and there was just an open field with almost no protection. But it was ok. The food- and watersituation was always ok. I could filter water from little rivers every day and I allways carried food for around two or three days with me and I stocked them up in the few little tows of Alichur and Murghab. 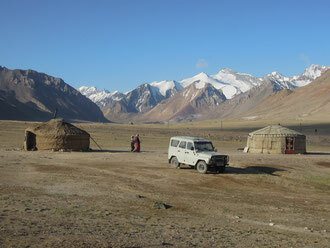 The highlight was the 4655m Akbaital (White Horse) Pass and the night in the beautiful Kyrgyz Yurt just after the pass. Although windy and sometimes even a little snow, in the Yurt it was perfectly warm an quiet. Very good fresh kefir, bread and Kyrgyz blacktea with yakmilk and salt there. 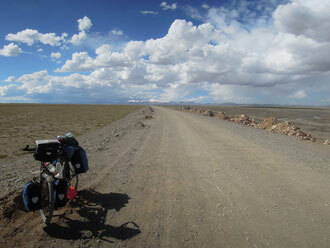 After this it was only some 50km to the high and lifeless saltlake of Karakol. At this altitude surrounded by mountains the weather is always chanching and you can see rain and black clouds on the other side of the lake while here the sun is shining. Don't underestimate the altitude and the colder and windy weather. 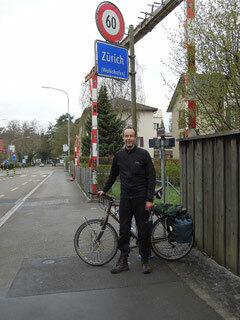 I met some cyclists that had some problems with it (cold, headache, feeling sick). Between Murghab and the border to Kyrgystan there is very little traffic: some days only 4-5 cars the whole day! I loved it. After 10 days of riding through the Pamir I crossed the border to Kyrgystan on 13.7. and suddenly it went down from 4'200m to around 3'000m, the valley became very wide and green, horses, yaks and sheep where grazing on the pastures and eagles were sitting on the telephone poles next to the road. It was getting warmer and the body relaxed after the harsh Pamir clima. After a week I said goodbye to Turdubai and his family where I stayed the last few days and made my way to China. I crossed the border on the 19.7. without any problems and felt very welcome in China. On the Chinese side from time to time a group of camels crossed the road and the scenery got again more desertlike with few green and hardly any villages. From the border it was still a two days trip down from 3'000m to 1'400m to Kashgar, an important Silkraod town at the edge of the Taklamakan desert. From Dushanbe it was first a very nice 110 km ride on sealed road for the first day. On day two the paved road stoped and for the next three days it was nothing but rocks, gravel and sand and every now and then a Chinese truck passing by. 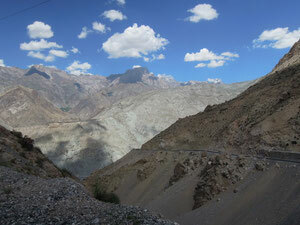 It is unbelievable that this is one of the two only roads to the Pamir. The landscape is beautiful and most of the time we have the roads for ourselves. But not enough that the road is in a very bad condition, there is also an 3'250m pass to cross before getting to the Panji-Valley which marks the boarder between Tajikistan and Afghanistan. In the Panji-Valley the road is not much better: sometimes seald sometimes loose gravel sometimes a mixture. Signs of land mines warn not to get off the road at many places. Still a bad souvenir from the Russian Afghan war. And you better don't get off the road, there really are still some mines. Sometimes you see teams scanning the hills for mines. Once over the pass we drive along the Afghan Border for four days. We always sleep in our tent, asking somebody to camp in the garden or look for a nice safe spot next to the road. Normally we go to sleep around 8 or 9 p.m., when it gets dark and we get up with the sun around 5 and 5.30 a.m. when the sun rises. After eight cyclingdays we were all a little bit tired and looked forward for some restdays in Khorog. Now Fred, Wendy and I are staying at the Lalmo Guesthouse at Khorog, which I can recomend. 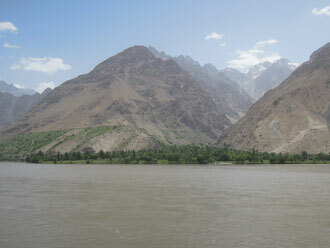 Khorog lies at 2'100m and is the gateway to the Pamir Highway at 3'500-4'600m. It is good to have some resting days for relaxing and shopping before getting on the bike again. First contact with Uzbek culture... I decided to write the blog in english because i meet here many ather travellers and english is the language to communicate. The internet is so slow here, i cannot upload any pictures yet. Probablely this will only be better in China in a couple of weeks.